From the Project Pyramid course to Center-sponsored events, the Turner Family Center for Social Ventures provides opportunities for students to leverage resources, learn more about social impact, and pinpoint ways you can alleviate poverty. We believe that poverty is a personal problem for everyone, and the purpose of the Social Enterprise Consulting (SEc) group is to provide concrete opportunities for students to leverage their individual strengths and skill sets in order to positively contribute to a proactive solution. The SEc matches students with social enterprises with real strategic, development, human capital, or operational needs, trains them on how to be responsible partners, and supports them throughout their consulting engagement. Project Pyramid, a Vanderbilt University organization, creates a community that addresses issues of poverty in an interdisciplinary classroom and through sustained partnerships with local and international organizations. Its members learn to recognize multiple poverties from one another in the classroom and from individuals and organizations that encounter poverties first hand. Students respond to knowledge gained in the classroom and through collaborative partnerships by engaging in action to alleviate poverty. The 2018-19 Project Pyramid application is now closed. The Hult Prize Foundation is a not-for-profit organization dedicated to launching the world’s next wave of social entrepreneurs. It encourages the world’s brightest business minds to compete in teams to solve the planet’s biggest challenges with innovative ideas for sustainable start-up enterprises. The Hult Prize Competition at Vanderbilt is a preliminary for regionals. The ultimate national prize is $1M in seed funding. The 2018-2019 Hult Prize Case Competiton is now closed. 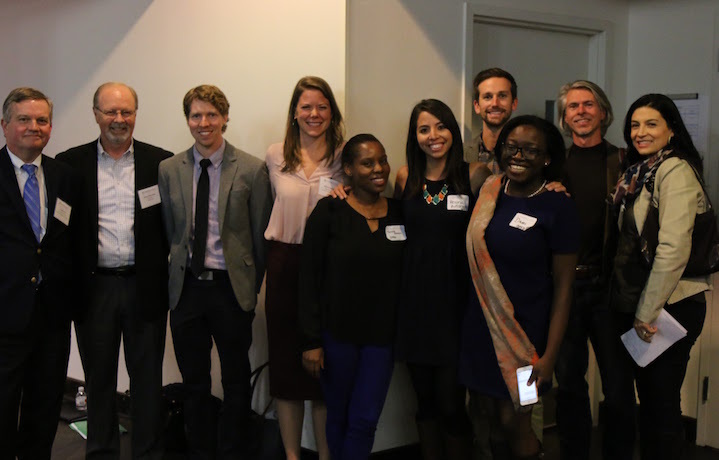 Be part of Vanderbilt’s first Impact Investing team! MIINT is an experiential lab designed to give students at business and graduate schools a hands-on education in impact investing. It is an initiative of Bridges Impact Foundation, and is conducted in partnership with the Wharton Social Impact Initiative. For anyone interested in impact investing, this is an opportunity to learn from experienced impact investors through guided training. It’s also a chance to form Vanderbilt’s first Impact Investing team and compete with top business schools globally for a chance to win $50,000 for an existing early-stage company. In addition, students will network with current and future leaders in impact investing and gain access to impact investing jobs and internships. The 2018-2019 MIINT application is now closed. TFC Treks are student-led experiential learning trips with interdisciplinary groups of Vanderbilt graduate students. The goal of these experiences is to connect students with a variety of cross-sector approaches to social entrepreneurship in different cities. Join a trek to engage with peers, alumni, professionals, and organizations creating market-based solutions for social impact! To learn more about upcoming treks, subscribe to our newsletter here! Through TFC Summer Fellowships, Vanderbilt University graduate students bring their expertise and education into meaningful action with partner organizations focused on social enterprise, which may not otherwise devote resources to interns. In partnership with TFC leadership, students seek and match with partner organizations based on fit to gain valuable work experience integrating business and social impact, while receiving a stipend and support from the TFC. Check back soon for more information about 2019 Summer Fellowships! 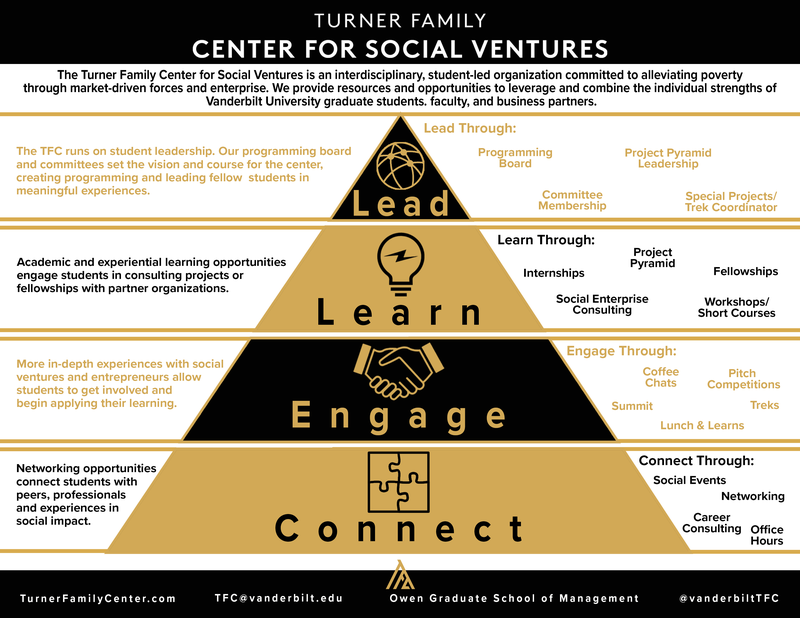 The Turner Family Center for Social Ventures is excited to be able to facilitate student learning beyond campus by providing partial reimbursement for student attendance at social ventures focused conferences across the country. The TFC provides funding for projects aligned with its mission of alleviating poverty through market-based solutions. If you have an idea that you think fits perfectly with our organization, let’s start the conversation. The TFC staff host weekly office hours to help you engage and learn more about the center, while exploring options for how to maximize your time at Vanderbilt and in your career. All office hours are held at the TFC’s offices on Owen’s first floor. On Thursdays, TFC Director Mario Avila holds advising hours to speak with students about their future careers and how to leverage time in graduate school to gain exposure to opportunities in social impact work. Schedule time to meet with Mario on Thursday afternoons in his office at Owen. Monthly Lunch & Learn events, Sips & Social Ventures social hours, and Featured Speaker Series provide graduate students with the opportunity to connect with the TFC and with one another. Check out the calendar to join us for the next one! As a student, this is your center. No matter your background or area of study, there’s an opportunity for you to get involved. Check out our calendar to find ways to engage at every level.